Full Description: One of a series of large black and white photographs of Tommy Williams, taken in the mid-1970s by Les Davies in Tommy's top floor attic workshop at 74 Tennyson Street, Battersea. Tommy Williams was a Lachenal craftsman/tuner in the 1920s, and was interviewed and recorded for a Free Reed label LP by Neil Wayne and Nic Kinsey in 1975; those recordings are now available on the Free Reed CD "Masters of the Concertina" FRRR 12, available at www.free-reed.co.uk/frrr12 . The images show Tommy playing, smoking his pipe, tuning reeds and seated amid the rather chaotic workshop room. 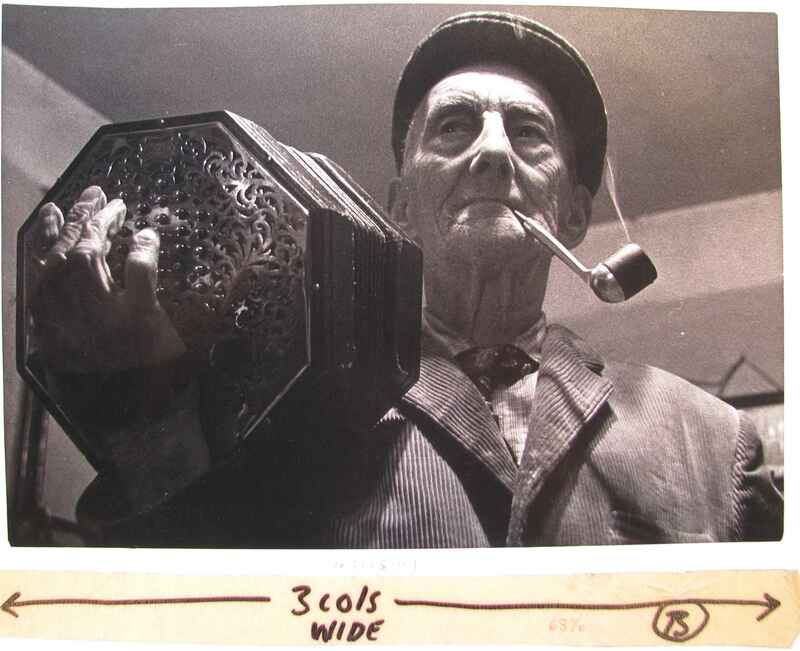 This one features Tommy with pipe and Duet concertina.